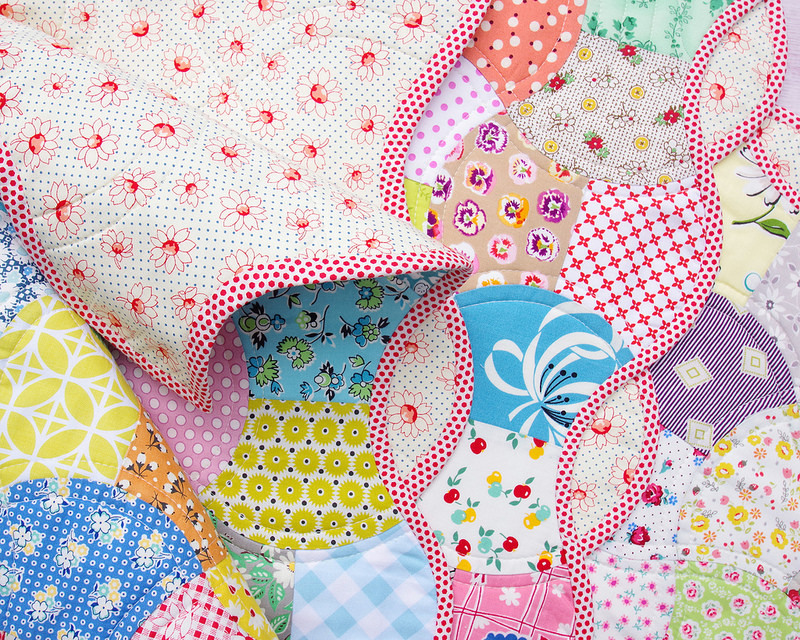 The Scrappy Apple Core Quilt is finished. 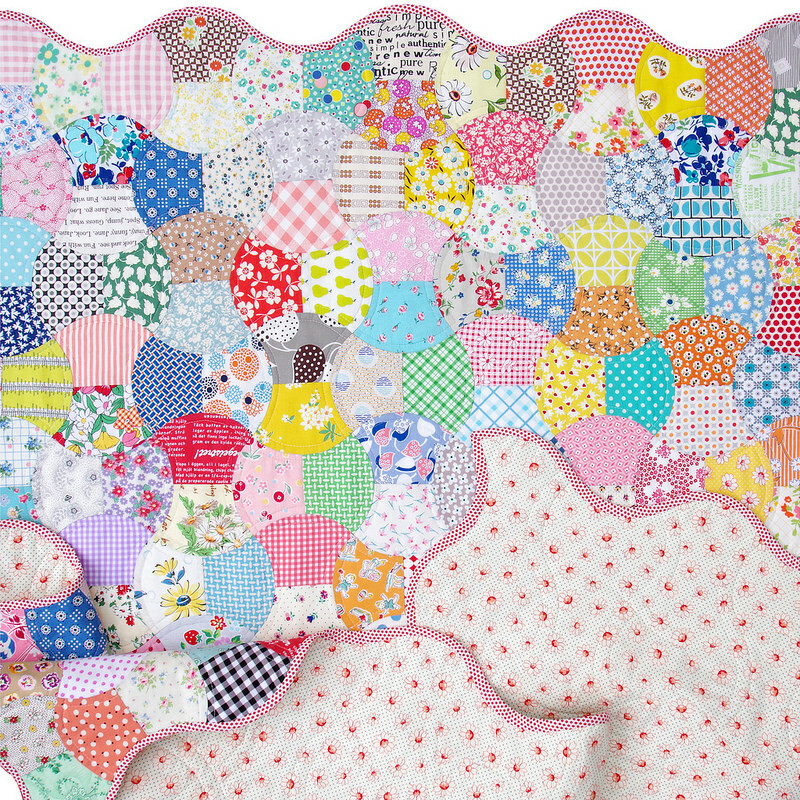 (This quilt was made using the acrylic templates provided with the Nickels and Dimes Quilt Pattern by Everyday Quilts). I am so pleased with how it turned out and love that I was able to work out a way to machine piece the quilt top. 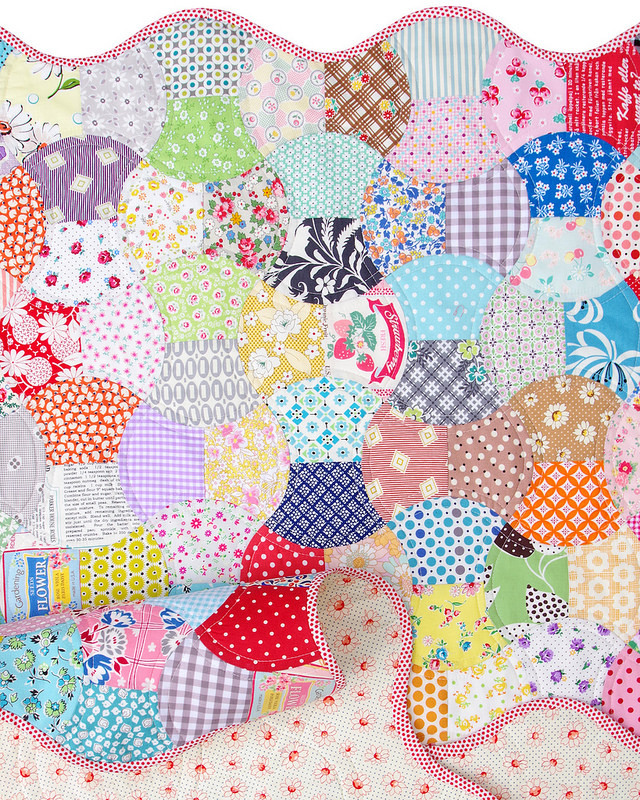 This quilt may otherwise have remained unfinished. Forever. 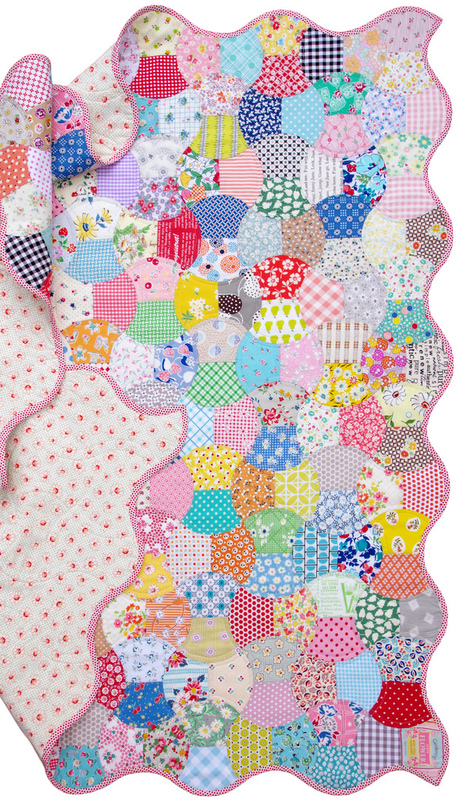 I do however want to continue to work on my hand piecing skills but intend to start with an easier project. Perhaps a quilt with straight seams only. Slow sewing is so relaxing! 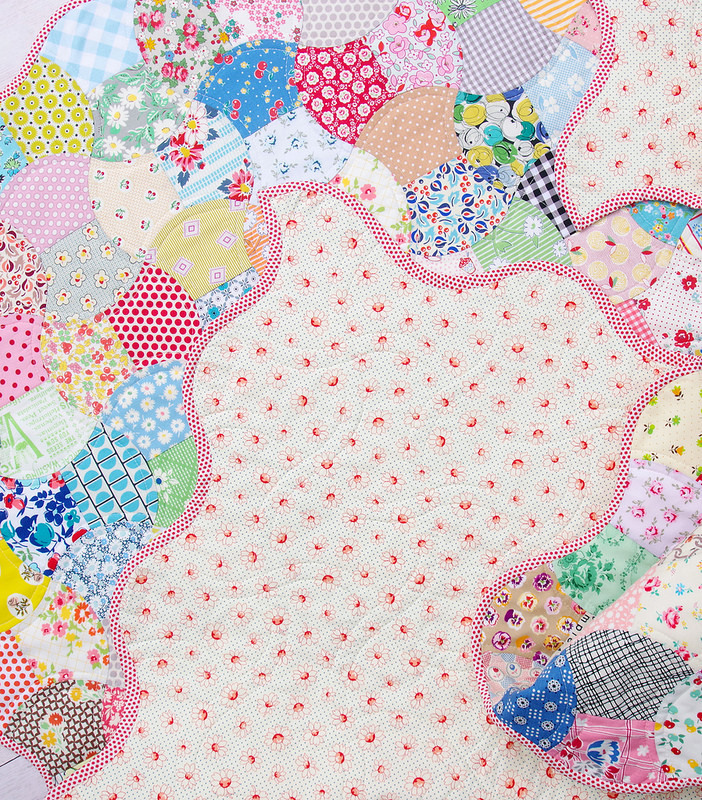 I have quilted the quilt by simply outlining the seam lines. 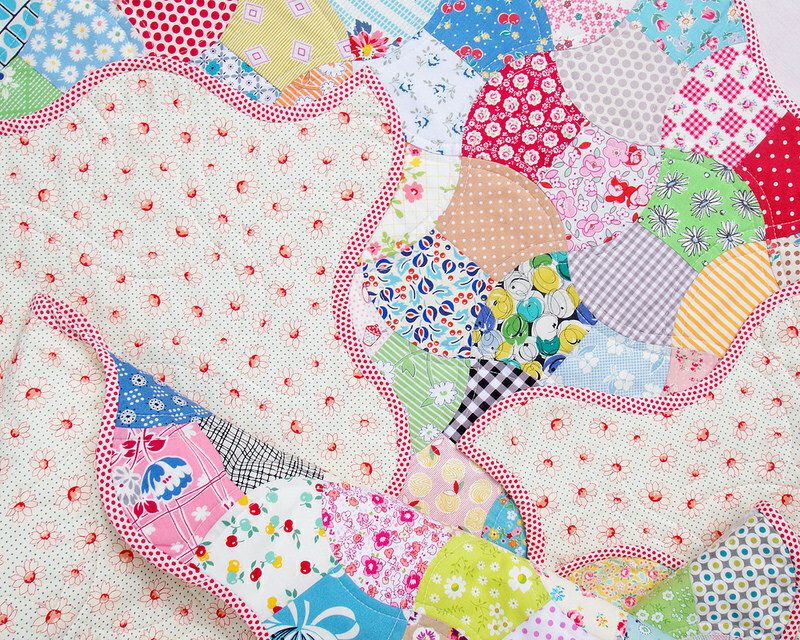 Having to slowly meander along both sides of the the curved seams of the quilt is not as easy as it sounds or looks. 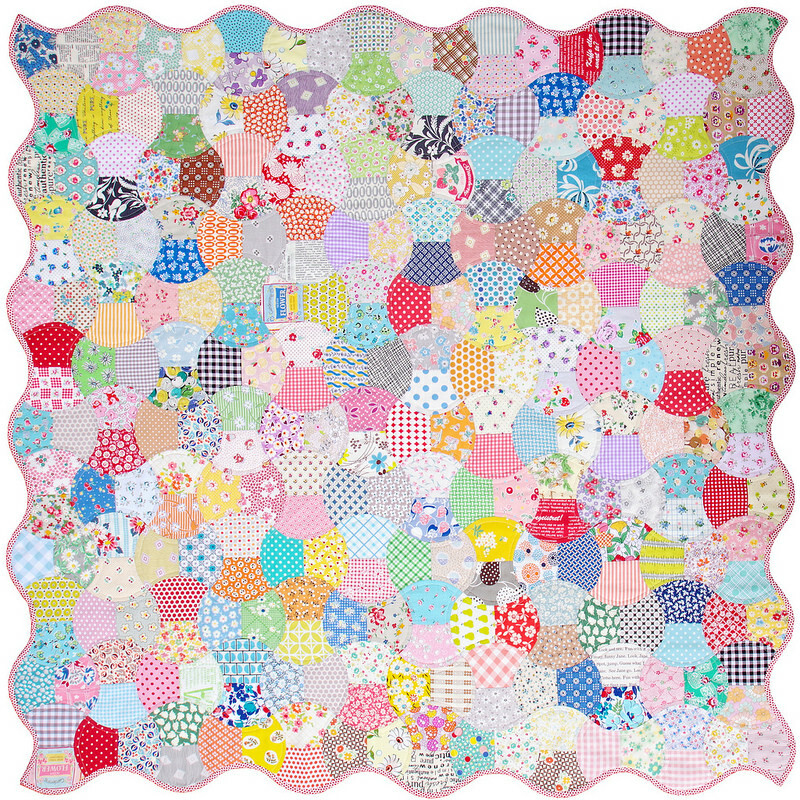 It is slow going manoeuvring the whole quilt from edge to edge at a steady and even pace to ensure that the the stitching lines remain smooth and continue to follow the curves of the quilt design. 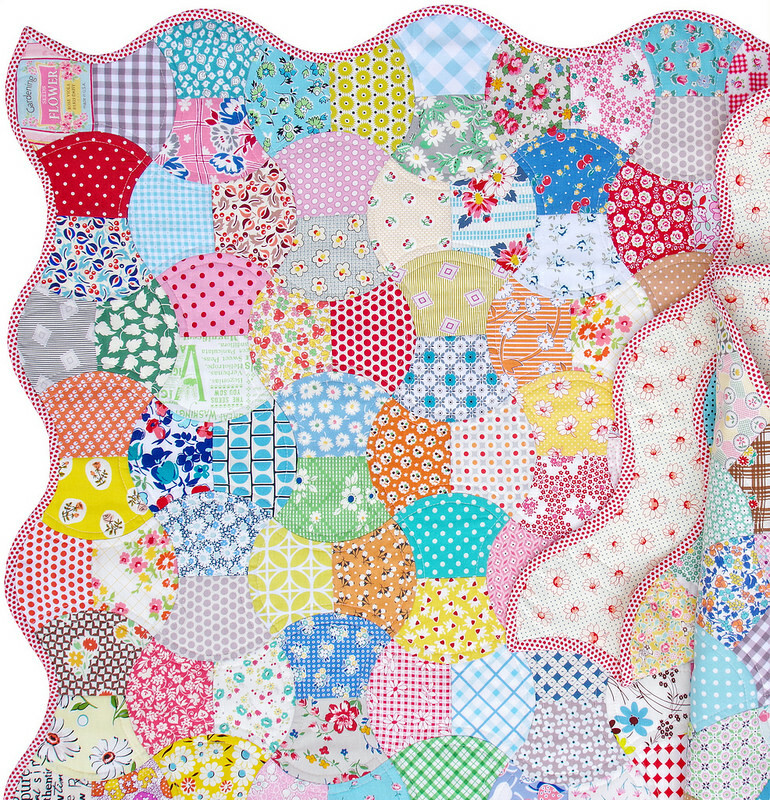 Having the quilt well supported is a must as are steady hands and strong arms! 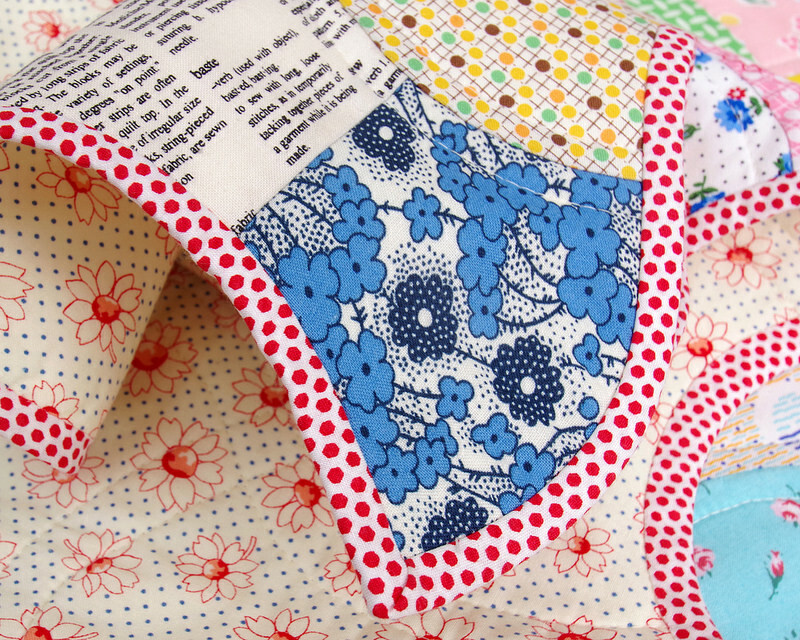 For the back of the quilt I have used a single small scale floral fabric from the Retro Child Smile (Spring 2016) collection by Lecien Fabrics. 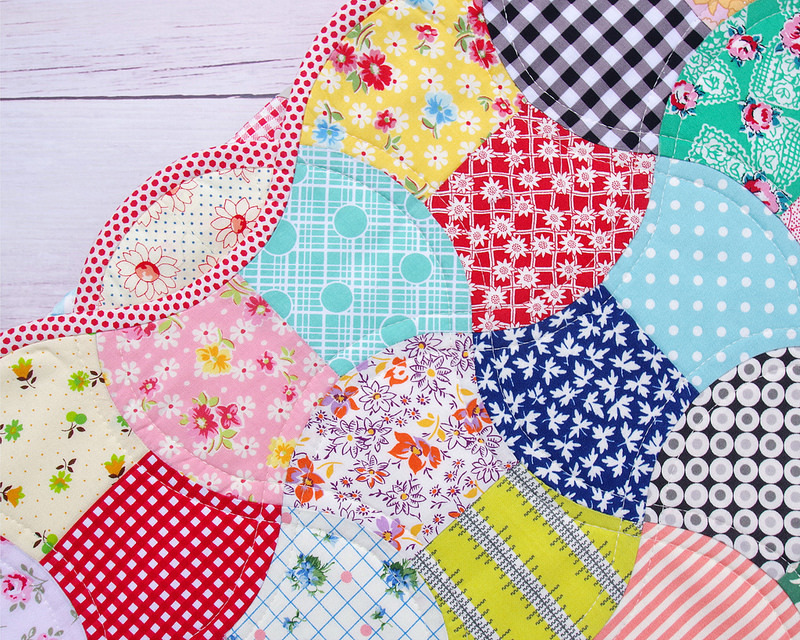 This reproduction print perfectly complements this traditional design and the vintage vibe of the quilt. 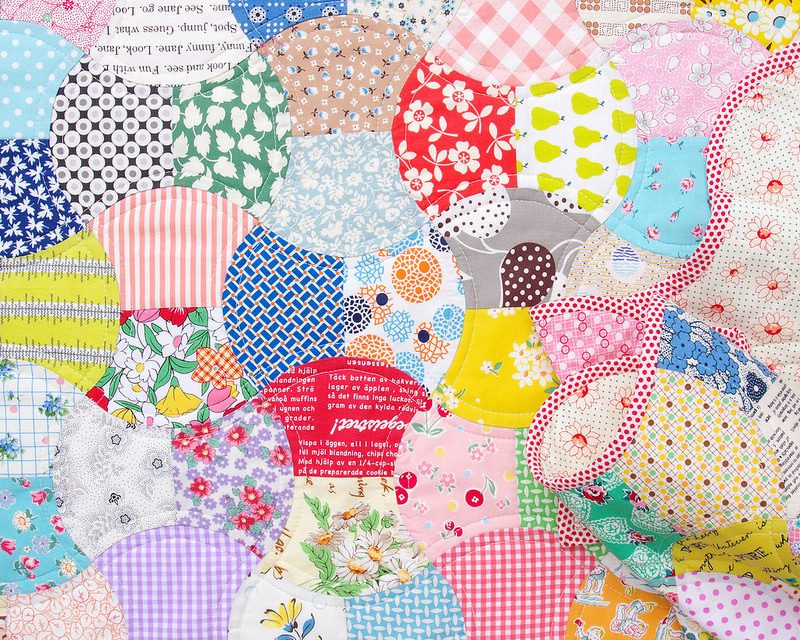 For the quilt binding I have used a red hexagon dot fabric by Suzuko Koseki for Yuwa Fabrics. 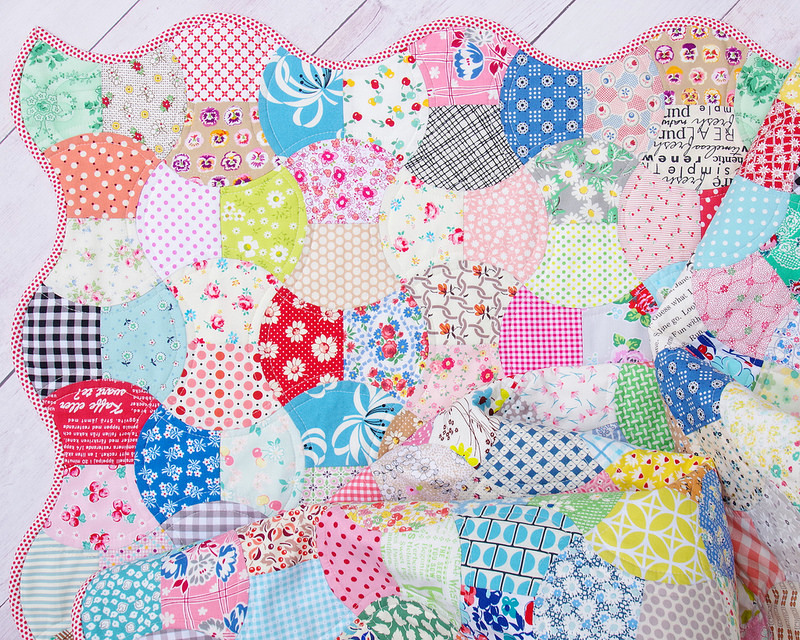 And as you can see I have preserved the curvy edges of the quilt. I made two attempts at making and attaching the bias binding to the quilt. My first attempt was immediately after finishing the quilting and trimming back the batting/backing fabric. It was also just after midnight and I thought it might be nice to finish the evening by "quickly" sewing the binding on to the quilt. Well, it didn't take long to realize that maybe this wasn't a quick task, that after midnight was not a good time to try my hand at an unfamiliar task, and that I had not made enough binding to wind its way around the curvy edges. My second attempt at making and attaching the binding to the quilt (the next day) was much more successful. I made more bias binding and while not a single pin was used to piece the quilt top, I used many pins to sew the binding to the quilt! It took at least an hour to make my way right around the quilt ... pinning, sewing, stopping, adjusting the binding, adjusting the quilt, moving pins, etc. 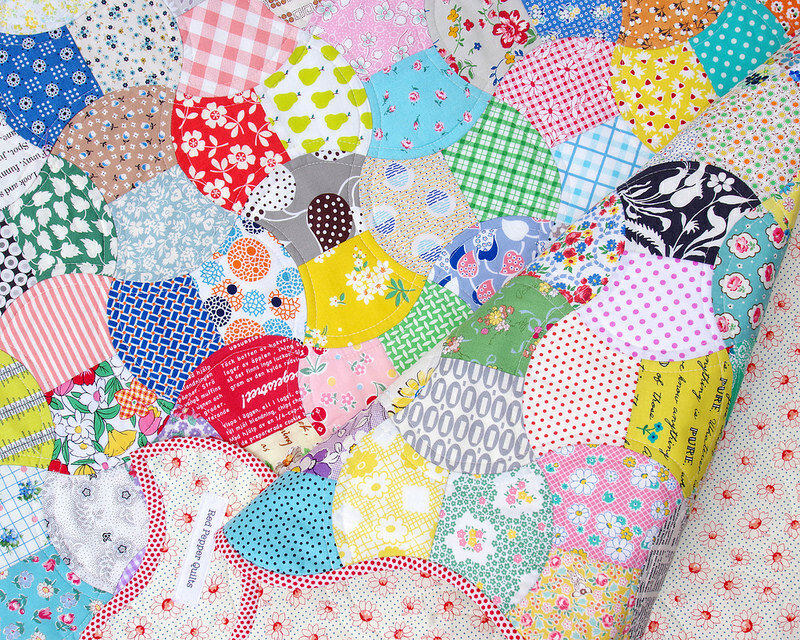 I then slip-stitched the binding to the back of the quilt by hand. I think it was well worth the extra effort and I wouldn't hesitate to work with bias binding and curvy quilt edges again. 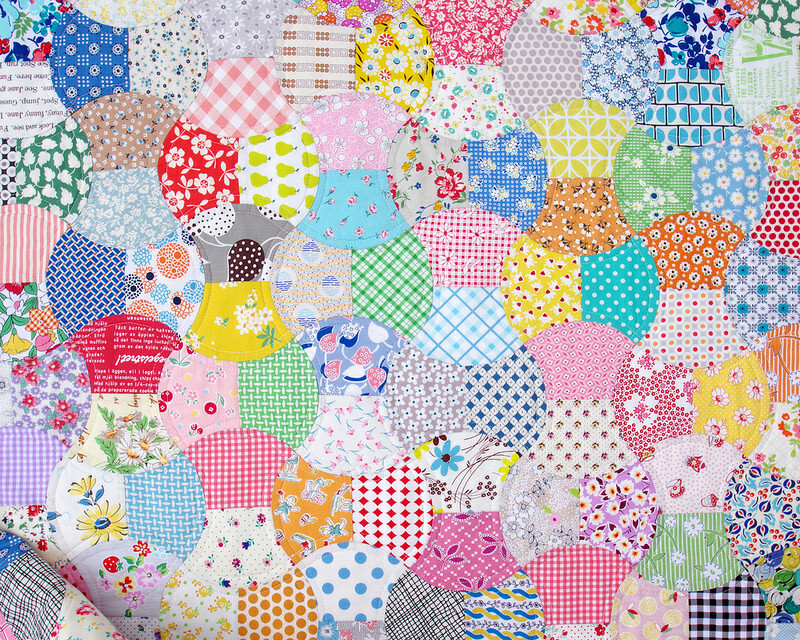 The finished quilt measures 51 inches x 51 inches. sewn into 36 blocks of 4 Apple Core Units. the curvy seam lines (edge to edge). Cotton thread for piecing and quilting. 100% low loft cotton batting. The finished quilt is for sale and is listed in my Etsy Store. Thank you for stopping by and scrolling through the photos! great job. 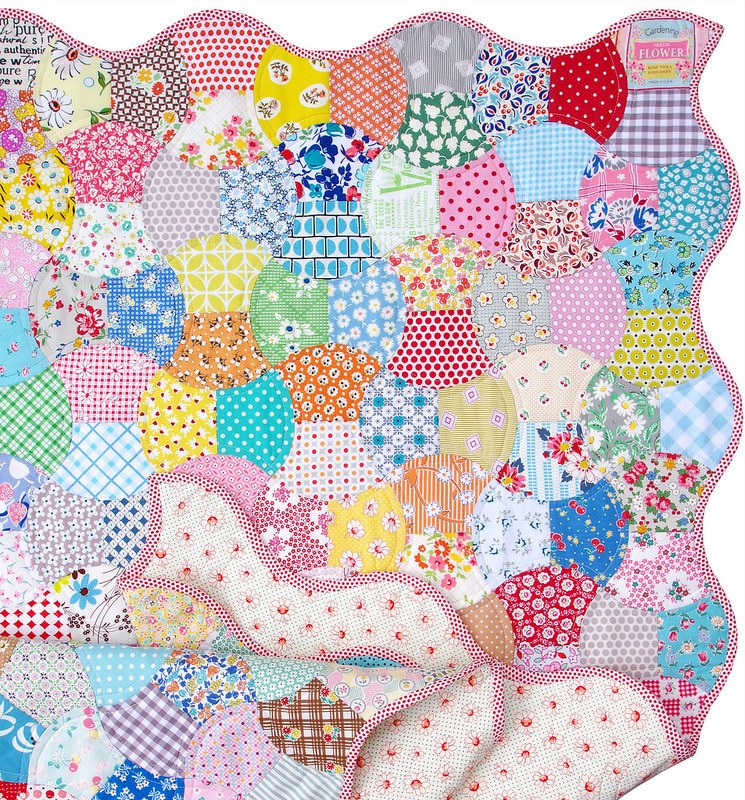 i am currently hand piecing one. I take it on my road trips,holidays etc. its my Take Along project. your finished piece is an inspiration to me. It turned out very nicely. Congratulations! This is gorgeous! The curvy binding makes the entire design just sing! Well done and of course, you make it look so easy...I'm in awe. Wow, I love the binding and backing! 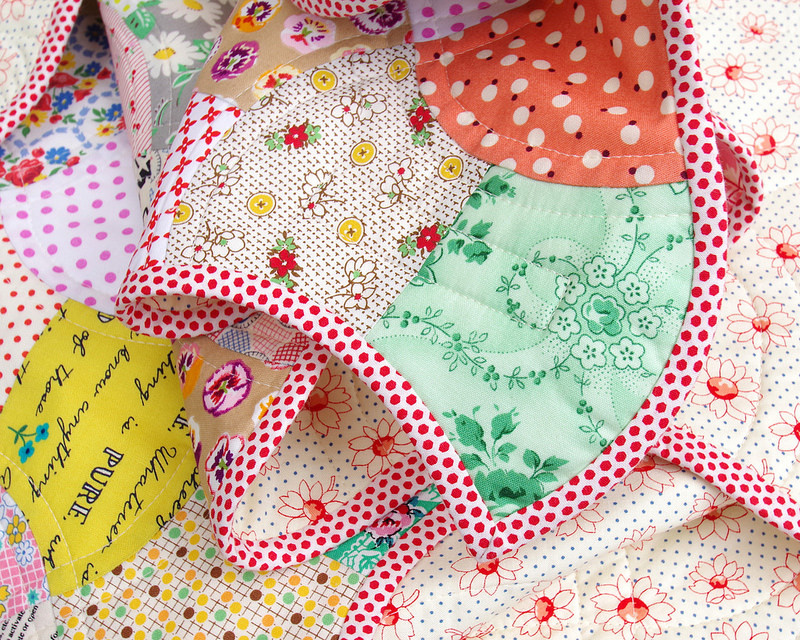 Thanks for the great tips for sewing the binding. 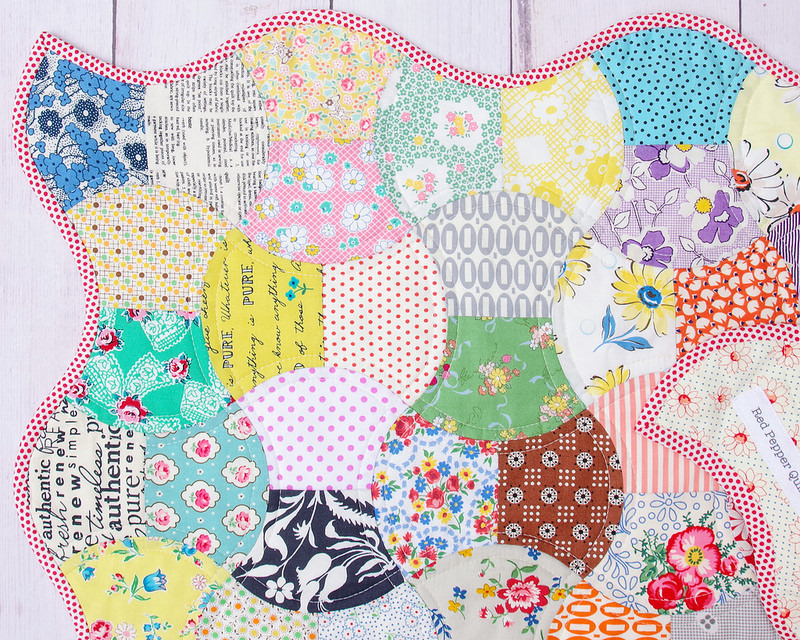 I love this pattern, and the patchwork style.